As part of my ongoing effort to bring the most fascinating material to you, my loyal readers, I made the great sacrifice of spending a weekend in Baltimore with my girl watching the Red Sox win two baseball games against the Orioles. I know, I know… the sacrifices I make, huh? It’s, like, Ghandi, Mother Theresa, and then me. Anyway, as a testament to what can happen when spontaneity gleefully interferes with personal responsibility, late on Friday afternoon Meghan and I decided that it would be fun to go see the Red Sox play the Orioles in Boston one weekend this summer. Her sister lives there, so we had a convenient and cheap place to stay. However, a look at the Red Sox schedule revealed that the only weekend which would work for us was that weekend. So we got tickets and went! A long drive down on Saturday thanks to rain and traffic got us down there a few hours late, but luckily the game was on rain delayed so got in there by the third inning, but not after a huge hassle of trying to get our will-call tickets. 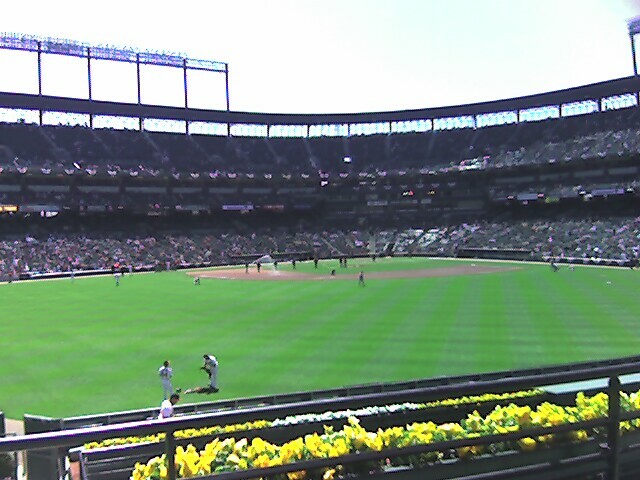 If you are a baseball fan, it is worth the pilgrimage to Camden Yards. As a life-long Red Sox fan, I never thought I would want to see a stadium other than Fenway in Boston, but I have to say that Camden Yards makes a pretty good argument for it. Beautiful facilities, comfortable seating, plenty of open spaces and sitting areas and great views of the game all around. A few interesting observations: first of all, Red Sox fans made up at least 70% of the crowd. I don’t know who would have been there if the Sox fans hadn’t been there. Maybe the O’s fans stayed away because they knew there would be a lot of Boston fans there, but it was a really weak showing for them. The fact that there are so many Red Sox fans willing to drive at least 6 hours – more like 8 for us – from the Boston area to Baltimore just to see their favorite team plays speaks to the sheer lunacy of Red Sox fans. We’re sick and we love it. However, there were enough O’s fans to scare the daylights out of us during the national anthem. It is apparently a tradition of theirs in Baltimore to SHOUT "O!" during the second to last line of the Star Spangled Banner: "O say, does that star-spangled banner yet wave"
This was my first time seeing a baseball game outside of the Boston area, so it was interesting to see the stadium have to put up requests for the home crowd to make more noise and to simply see a stadium that wasn’t sold out. Never experienced that at Fenway and even not that often at McCoy stadium. Besides seeing the two games, we also hit the local Hard Rock Cafe real quick – just to pick up a few shirts and pins. We ate dinner at the Wharf Rat (wing review here) on Saturday night, trying the traditional Maryland crab cakes. Basically a ball of crab meat barely held together by some bread crumbs with plenty of Old Bay seasoning. Perfect! A road trip can be such a great experience and this one was. In 40 hours we drove to and from Baltimore, watched 2 Red Sox Games, went to the the Hard Rock Cafe, ate at a Brew Pub, tried Maryland crab cakes, had breakfast at Denny’s, ate deep-fried hot dogs, and laughed a whole lot. It was a ton of fun and so glad that we we spontaneous enough to do it.